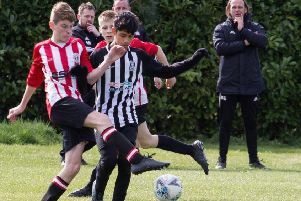 Asfordby FC Development’s Bonser Trophy defence came to an end after a second-half collapse in Thursday’s semi-final. They looked on course for a repeat of last year’s final against Wymeswold FC Reserves when Jamie Felstead’s strike gave them a 1-0 half-time lead. But Division Three champions Sporting Markfield Reserves turned it around in the second half as Asfordby were reduced to 10 men. A brace from Callum Rousseau and goals from Dominic Phillips and sub Ryan O’Connor gave Markfield a 4-1 win. Yet Asfordby will have the consolation of back-to-back promotions to Division One if rivals Woodhouse Imperial fail to win their final match against Division Two champions Wymeswold on Saturday.